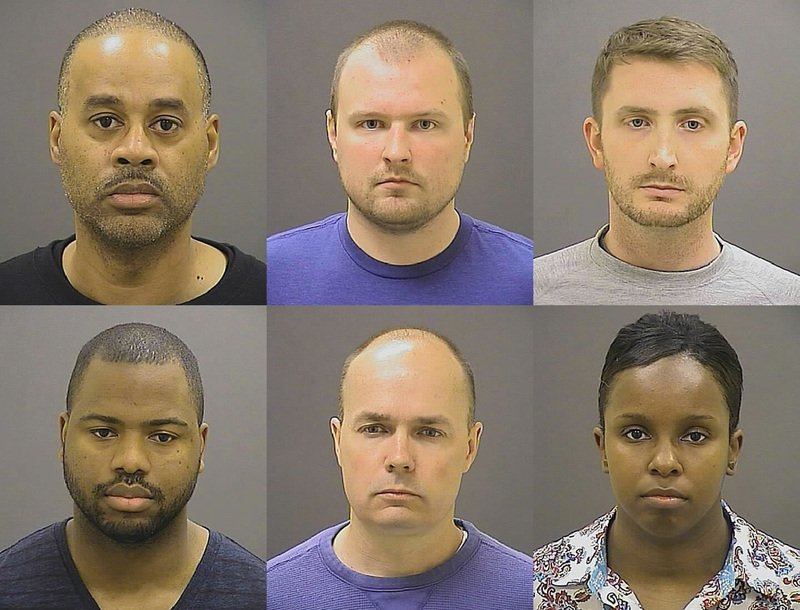 Prosecutors Drop All Remaining Charges Against Officers In Freddie Gray's Death : The Two-Way After four trials ended without convictions, prosecutors announced Wednesday that they were dropping all remaining charges. Gray died in 2015 after injuries sustained while in police custody. People walk by a mural depicting Freddie Gray in Baltimore on June 23, at the intersection where Gray was arrested in 2015. Prosecutors in Baltimore have dropped all remaining charges against police officers related to Gray's death while in police custody. 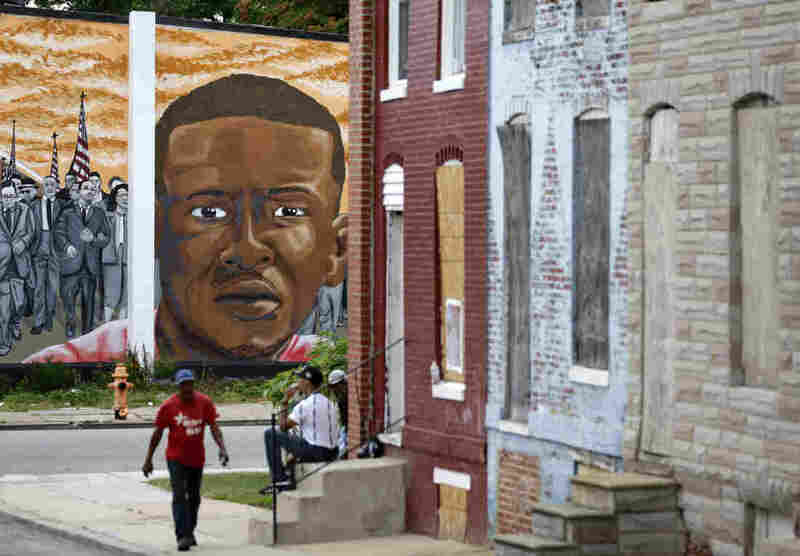 Prosecutors in Baltimore have dropped all remaining charges against police officers related to the death of Freddie Gray in 2015, reports NPR's Jennifer Ludden. A total of six officers had been charged in connection to the death. Four trials had ended without convictions — one, a jury trial, ended with a hung jury, and three bench trials returned verdicts of not guilty. Three more trials were scheduled. Baltimore State's Attorney Marilyn Mosby held a press conference this morning at the site where Gray was arrested. She said her office stands by the legitimacy of the original charges. Mosby, with obvious frustration, said that prosecuting police is "blatantly fraught with systemic and inherent complications," including uncooperative and biased officers. "Without real substantive reforms to the criminal justice system, we could try this case a hundred times, and cases just like it, and still end up with the same result," she said. It was an "agonizing" decision, she said, but "I must consider the dismal likelihood of conviction at this point." The announcement that charges were being dropped came at the start of pretrial motions for Garrett Miller, the next officer due to stand trial. In addition to Miller, Sgt. Alicia White was also facing trial. Officer William Porter, whose trial ended with a hung jury, was due to be retried. Six Baltimore police officers were charged in connection to Freddie Gray's death in 2015. All remaining charges have been dropped. Top row from left: Caesar R. Goodson Jr. (acquitted), Garrett E. Miller (charges dropped) and Edward M. Nero (acquitted). Bottom row from left: William G. Porter (hung jury, then charges dropped), Brian W. Rice (acquitted) and Alicia D. White (charges dropped). Gray, 25, was arrested in April 2015, handcuffed and transported in a police van without a seat belt. The autopsy report said that Gray suffered a single "high-energy injury" to his neck and spine; he died a week later. "His death added fuel to the growing Black Lives Matter movement and caused turmoil in Baltimore, including large protests and the worst riots the city had seen in decades," The Associated Press notes. The charges against the police officers involved included second-degree murder, manslaughter, assault, misconduct and false imprisonment. "The main allegations were that they failed to seatbelt him ... and failed to call for medical help," Jennifer tells our Newscast unit. "But in three bench trials, Judge Barry Williams made clear the state had failed to prove its case. He said officers have discretion when it comes to seat belting, and it was not clear to them that Gray had been injured until the end of the van ride." In some cases, charges depended on prosecutors arguing that there was no probable cause to arrest Gray in the first place — an unusual strategy, as NPR's Jennifer Ludden has reported. Other charges were based on the assertion that officers intentionally gave Gray a "rough ride" in the van, which Jennifer says has been difficult to prove. Prosecutors have been facing pressure to drop the charges after so many trials ended without a conviction. The entire trial process has been controversial in Baltimore. When Mosby first announced the charges, the audience was "stunned," NPR's Gene Demby reported at the time. "[A] litany of similar, high-profile cases never resulted in criminal charges against the police officers involved," he wrote. The audience cheered as Mosby read out the list of criminal charges. But the charges also faced an immediate backlash. "You had critics accusing Mosby of rushing to judgment," Jennifer Ludden says. "Some suggested she brought the charges just to quell" protests in Baltimore. As the cases proceeded, some observers said having the cases play out — conviction or no conviction — was helpful for the city. But others said it was unfair and even unethical to carry forward charges that were seeming increasingly unlikely to lead to convictions. "Many in Freddie Gray's neighborhood did not expect convictions," Jennifer notes. "There is a widespread skepticism of the criminal justice system. "But I don't think that these trials have, you know, made that much better."